And all was seemingly fine… except for the fact that the sale is next weekend. We’ll try again. Since we were in Hollywood, we decided to explore a little bit. He had been intrigued by the Hollywood Canteen since he drove by it a few months ago and She had never heard of it, so that was our first try. It was closed. But we’re intrigued by this little out of the way place tucked in between a million studios. We’ll try again. After some back and forth about where to go next (this is the most organic, unplanned Field Trip Fridays ever), She told Him about Mercantile, a new wine bar He had never heard of, so He tried to make a B-Line for The Well. It was closed. We’ll try again. Upon entering we were both a bit confused. Do we seat ourselves? Where do we order? Can we get wine at the counter too, or do we order that at the bar? Luckily, a waiter handed us a menu on a clipboard and told us to order at the counter. The food looked delicious. He still wasn’t convinced. We sat ourselves in the corner of the bar after ordering a Croque Monsieur (for Him), Poached Ahi Salad w/ Frissé (for Her) and Potato Salad (for Us). He still wasn’t convinced. We had only quickly browsed the wine list before ordering, because we saw it at the last minute. We both ordered reds. When we had more time to consider and peruse the list, He exclaimed excitedly “Txakolina!” We had been offered a taste of this exact same wine by Steve at Palate a few months ago and it had been kind of a Romancing The Stone treasure hunt for Him to find it again. Nobody in LA seems to have Txakolina after the summer. 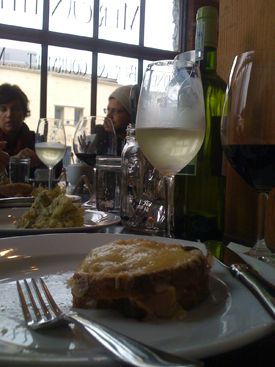 The food, the wine selection, and Paul the Bartender were great enough to erase any questions we had about the place. He was totally convinced. Back to Paul for a minute. 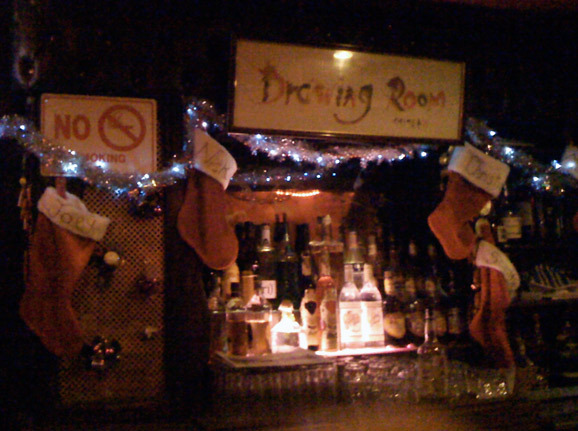 We just want to say “Thanks.” It’s very nice to find an engaging, intelligent, welcoming young bartender in this town. Not saying they don’t exist, just saying it’s nice, and he (along with the wine and food) really made us enjoy our experience. We’ll try it again. He said: Very dark in color with blueberry, cassis, tobacco and cedar on the nose. My first sip wasn’t that impressive; not bad not good. After Paul poured us Txakolina, I let this wine sit for about 45 minutes. When I drank it again it was terrific. I don’t know if it just needed to open up, or if it was the food, or my mood change, but now this wine was terrific. Milky, creamy, chocolate and coffee textured with a nice vanilla finish. Great tannins (that lightened nicely over the course of the meal.) I think I am becoming a fan of Spanish wine. Salud! She Said: Bright ruby color and thin, as is typical. Aromas of sour cherries, a bit of under brush, and dried flowers. No real spice sensed. In the mouth the wine has high acid, is a bit tightly wound, but finish is long and luscious. Not an overly complex or brambly, big fruit-forward pinot. Rather it is elegant with supple, approachable tannins. Highly enjoyable. Would have chosen differently with my salad, which had a pretty acidic dressing. She Said: His excitement and passion for this wine is infectious. And I love it that He has been able to make strong declarations about what He enjoys and doesn’t in a wine’s flavor profile. This is real progress. I’ve been drinking Txakolinas for years…Manfred Krankl had it on the list at Campanile when I was his assistant. For a hot summer day they can’t be beat–bright, bracing acidity, low alcohol, refreshing, mild apple and unripe pear flavors, and with a slight, zingy fizz. 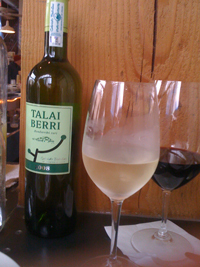 Turns out the wine is great with poached ahi tuna as well…should have ordered this wine with my salad. At $20 a bottle I can’t say it’s a bargain…there are plenty of delicious, quality whites for under that price out on the wine market. But Txakolina is fairly rare and I’m sure not the easiest thing to import. The price does knock down the score for me. He said: This wine is meant to be poured into the glass from a certain height, and when Paul poured it I could see why right away. It bubbles like the Basque Ciders I remember having a few years ago. Very lemony on the nose. So refreshingly dry in the mouth with some fizz. Very high acid and again totally reminds me of drinking Cider from barrels in the wall in the Basque hills (think: bite). It should be noted that I am a Basque-o-phile. I have studied the place for years, visited on several occasions, met the greatest people, and had some of the best food of my life there. It is intrinsically connected to my life; the place is why I am an architect. I’ll just say it: I love this wine. It may be my favorite white wine I’ve ever had. It’s great by itself and I think it would be great with seafood. I can’t wait to go back to the Basque Country and visit the Museo de Txakoli, and try this in some of my favorite San Sebastian restaurant. Postscript: this morning some friends twittered us saying they were going to Mercantile and wanted recommendations. Of course, I said to try the Txakolina. They re-tweeted to say the wine was perfect, and they too bought a bottle. I really just love this wine. He used to frequent this mini-mall bar semi-regularly and had just been on a recent afternoon with His architectural partner. (A business meeting with cocktails.) At night it’s the Silverlake/Echo Park/Hollywood crowd. (Sidenote: Let’s all stop saying “hipster” to describe this crowd. It’s vague, blanketed and a little ridiculous. We’re tired of it.) It’s a much different place during the day when the place is full of quite serious day-drinkers. So we ordered as such: She had a Maker’s on the rocks, He had a Absolut+Tonic. One of the daydrunks offered us some pizza, when we declined he opened two pizza boxes sitting on the bar to reveal they were empty. Thanks, Cocksucker. By the way, you aren’t Bukowski, get a job. The bartendress, in between coughing, would sing along to the music on the jukebox and we were both struck by what a beautiful voice she had. We both knew we were just having one drink here. It is a nice neighborhood bar, a little dingy and scary, but everything shouldn’t be clean and safe…that would be boring.